Funding This work has been supported by grants from INCa (PLBio), Lilly Research Programs and Novartis. Thromboembolic events are the main cause of mortality in BCR-ABL1-negative myeloproliferative neoplasms (MPNs) but their underlying mechanisms are largely unrecognized. The Janus kinase 2 (JAK2)V617F mutation is the most frequent genetic alteration leading to MPN. Usually found in haematopoietic progenitors and stem cells, this mutation has also been described in endothelial cells (ECs) of MPN patients. In this study, we have questioned the impact of the JAK2V617F mutation on EC phenotype and functions. We developed an induced pluripotent stem cells strategy to compare JAK2 mutant and wild-type ECs. Transcriptomic assays showed that several genes and pathways involved in inflammation, cell adhesion and thrombotic events were over-represented in JAK2V617F ECs and expression levels of von Willebrand factor and P-selectin (CD62P) proteins were increased. Finally, we found that leucocytes from MPN patients adhere more tightly to JAK2V617F ECs. Our results show that JAK2V617F ECs have a pro-inflammatory and pro-thrombotic phenotype and were functionally pro-adherent. BCR-ABL1-negative myeloproliferative neoplasms (MPNs) are clonal disorders characterized by increased levels of mature myeloid cells in the peripheral blood. MPNs include polycythaemia vera (PV), essential thrombocythaemia (ET) and primary myelofibrosis (PMF). MPNs are linked to the somatic acquisition of genetic alterations targeting genes involved in intra-cellular signalling pathways. The most frequent of these genetic alterations is the Janus kinase 2 (JAK2)V617F mutation (NP_004963.1:p.Val617Phe), found in approximately 95% of PV, and in approximately 60% of ET and PMF patients, respectively. This mutation induces a constitutive activation of the Janus kinase/signal transducers and activators of transcription (JAK/STAT) pathway in mutated cells. Since the discovery of the JAK2V617F mutation, several other somatic mutations have been identified in MPN patients, some of them targeting genes regulating the JAK/STAT pathway (MPL, CALR), others the epigenetics regulation (TET2, ASXL1, EZH2, DNMT3A) or splicing machinery (SRSF2, U2AF1, SF3B1, ZRSR2). The clinical course of MPNs is characterized by a chronic phase, during which morbidity and mortality are mainly due to thromboembolic events, followed by an inconstant and late accelerated phase with evolution to myelofibrosis or acute leukaemia. The reasons why MPN patients are prone to thromboembolic events are largely unknown, although the thrombotic risk in these patients has been related to several parameters such as increased haematocrit and blood viscosity, leucocytosis or platelet dysfunction. Thrombotic manifestations in MPNs include microcirculatory disturbances, arterial thrombosis and venous thrombosis. MPNs are particularly related to splanchnic vein thrombosis (SVT) affecting unusual sites of venous thrombosis like hepatic (Budd–Chiari syndrome [BCS]), portal (portal vein thrombosis [PVT]) or mesenteric veins. SVT affect 0.9 to 5% of PV and 3 to 10% of ET patients. Among patients presenting with SVT, approximately 40% and 30% of BCS or PVT patients, respectively, have underlying MPNs. Looking for the causes of this particular link between MPN and SVT, several studies have reported the presence of the JAK2V617F mutation in endothelial cells (ECs) isolated from the hepatic venules of patients with MPN and BCS. This mutation has also been found in ECs derived from spleen capillaries or endothelial colony-forming cells of MPN patients. These observations indicate that the mutation found in patients' blood cells may also be present in ECs of the same patient, possibly due to the acquisition of the mutation in a common progenitor. However, the relationship between the mutated ECs and the MPN patients' predisposition to thrombosis is still unclear. The implication of ECs in thrombotic events is largely recognized because of the well-known role of the endothelium in thrombosis and haemostasis regulation. To address the question about the plausible relationship between the JAK2V617F mutation in ECs and the thrombophilic state of MPN patients, we have established and characterized isogenic JAK2V617F and JAK2 wild-type (WT)-induced pluripotent stem (iPS) cells from an MPN patient and redirected these iPS cells towards the endothelial lineage. The characterization of these endothelial-like cells (ELCs) at the phenotypic and functional levels showed evidences that mutant ECs could exhibit both pro-inflammatory and pro-adherent phenotypes. Endothelial differentiation protocol was adapted from elsewhere. In brief, iPS cells were dissociated using Accutase and seeded at a density of 40,000/cm2 in mTeSR-1 medium (Stemcell Technologies) containing 10 μM ROCK inhibitor on Corning Matrigel Growth Factor Reduced (GFR) Basement Membrane Matrix diluted in a 1:50 in phosphate-buffered saline. The next day, differentiation was launched and the medium was replaced by N2B27 medium (Dulbecco's Modified Eagle Medium/Nutrient Mixture F-12 and Neurobasal medium [Gibco] in a 1:1 ratio supplemented with N2 supplement [100×] [Life Technologies], B27 supplement without vitamin A [50×] [Life Technologies] and 50 μM 2-mercaptoethanol) containing 7 μM of the GSK3 inhibitor CHIR99021 (Bertinpharma) and 25 ng/mL bone morphogenic protein-4. On day 3, the medium was replaced with StemPro-34 serum-free medium (SFM) containing 200 ng/mL vascular endothelial growth factor (VEGF)-165 and 2 μM forskolin (Abcam). On day 5, cells were dissociated using Accutase and CD144 positive cells were sorted using the CD144 (VE-Cadherin) Microbeads, human (Miltenyi). CD144+-enriched cells were seeded at a density of 26,000 cells/cm2 on 0.2% gelatine in StemPro-34 SFM with 50 ng/mL VEGF-165 for maturation. After 48 hours, medium was changed and the transforming growth factor (TGF)-β inhibitor SB431542 (Tocris) was added at 8 μM. Three days later, the resulting iPS-derived ELCs were dissociated using TrypLE Express (Thermo Fisher Scientific) and seeded at a density of 9,000 cells/cm2 on 0.2% gelatine in EGM-2 (Lonza) with 8 μM of TGF-β inhibitor. From this point, ELCs were passaged twice a week. All cytokines were purchased from Peprotech unless stated otherwise. ELCs' ability to perform tube formation was assessed in GFR Matrigel matrix (Corning). Cells grown to 80% confluency were deprived of growth factor supplements contained in the EGM-2 BulletKit (complement for EGM-2 medium, Lonza) except for the foetal calf serum (FCS) (2%) for 4 hours before harvesting them. Cells were seeded at a density of 30,000 cells/cm2 in 48-well plates, where GFR Matrigel had previously been polymerized, in basal medium supplemented with 2% FCS with or without 20 ng/mL VEGF-165. Each condition was performed in triplicate, and three independent experiments were performed. Images (4/well) were taken with an inverted phase-contrast Primovert microscope (Zeiss) at 6 and 20 hours after seeding the cells. ELCs were seeded on gelatine-coated tissue culture treated μ-Slide VI0.4 chambers (ibidi) at 20,000 cells/30 μL/channel and grown in EGM-2 medium containing TGF-β inhibitor (SB431542) until reaching confluence. Then cells were fixed with 4% paraformaldehyde and permeabilized with 0.5% triton- × 100. The permeabilization step was avoided in the cases where the extra-cellular presence of P-selectin was assessed. Image-iT FX Signal Enhancer (Thermo Fischer Scientific) was used to reduce non-specific fluorescence. Cells were incubated overnight at 4°C with primary antibodies against human CD144 (sc-9989, Santa Cruz; 1:200), von Willebrand factor (vWF) (A0082, Dako; 1:100) or P-selectin (kindly provided by Chloe James; 1:100), washed and incubated with fluorescence-conjugated secondary antibodies for 1 hour at room temperature. Nuclei were stained when mounting the slides with ProLong Diamond Antifade Mountant with 4′,6-diamidino-2-phenylindole (Thermo Fisher Scientific). For image acquisition, Zeiss LSM800 confocal microscope was used with a 40× objective. Images were processed with Zen blue edition Zeiss software and analysed using the Icy software. Both JAK2V617F and JAK2WT ELCs were seeded in 16 replicates in 96-well plates at a density of 2,000 cells per well in EGM-2 medium with 8 μM of TGF-β inhibitor as described above. Cells were incubated in an IncuCyte S3 Live-Cell Analysis System (Essen Bioscience) for 72 hours and images were automatically acquired every hour. Images were processed to obtain proliferation rates by using the IncuCyte S3 software (Essen Bioscience). ELCs were seeded on gelatine-coated tissue culture treated μ-Slide VI0.4 chambers (ibidi) at 30,000 cells/30 μL/channel and grown in EGM-2 medium containing TGF-β inhibitor for 24 hours. White blood cells (WBCs) were isolated from voluntary healthy donors or MPN patients from the Saint-Louis Hospital in Paris after informed consent. The study was approved by the local ethics committee (IRB00006477; N°2017–018). Freshly drawn blood was mixed with a 3% dextran solution in 0.9% NaCl in a 1:1 ratio to make the red blood cells sediment for 20 minutes. The supernatant was layered on top of a double gradient formed by Histopaque-1119 and -1077 (Sigma) following the manufacturer's recommendations and centrifuged at 700 × g for 30 minutes at room temperature. Two layers were obtained containing mononuclear and granulocyte cells, that were both retrieved together and washed twice in Hank's balanced salt solution with Ca+2 and Mg+2 (HBSS-CM). Cell number was determined using an automated Biorad cell counter. Cells were re-suspended at a density of 5 × 106 cells/mL in HBSS-CM and stained with 150 nM green calcein (Life Technologies) for 30 minutes at 37°C. After washing with HBSS-CM, cells were re-suspended in EBM-2 medium supplemented with 0.15% bovine serum albumin and added to the ibidi channels containing the ELCs at a cell concentration of 1 × 105 WBC/channel. After a 2-hour incubation time at 37°C, channels were thoroughly rinsed to remove non-adherent cells. Images were taken immediately after by using a Zeiss Axiovert fluorescence microscope (10 ×, 10 fields per channel) and processed with Zen blue edition software (Zeiss). Bright field pictures were taken to verify the ELC monolayer integrity on every field. Adherent WBCs, detected by green fluorescence, were counted using the Icy software. The expression of endothelial nitric oxide synthase (eNOS) and its phosphorylated form was assessed by intra-cellular immunofluorescence detected by flow cytometry. Briefly, ELCs grown to confluence were harvested and immediately fixed with 1.5% paraformaldehyde for 10 minutes at room temperature, followed by permeabilization on ice-cold methanol for at least 15 minutes. Intra-cellular staining was performed for eNOS (Alexa Fluor 647, BD 560102), or phosphorylated eNOS (Ser1177; BD 612392) after incubation with a fluorescence-secondary antibody (BD 563846). Nitric oxide (NO) production was detected by incubating ELCs grown to confluence and depleted overnight from growth factors with 10 μM 4-amino-5-methylamino-2',7'-difluorofluorescein diacetate (DAF-FM DA) (sc-205940, Santa Cruz Biotechnology) for 30 minutes, following a protocol adapted from the literature. Cells were then washed, and NO synthesis, estimated by DAF-FM DA green fluorescence, was monitored during the following 15 minutes by image acquisition using the AxioObserver Z1 microscope (objective 10×) and AxioVision 4 software (Carl Zeiss). Intensities of fluorescence were normalized to the cell surface area by using the Icy software. Statistical analysis of microarrays has been described above. Mean and standard deviation of proliferation assays were computed using the IncuCyte software. Mean intensities of confocal microscopy were compared using an F-test. The statistical analysis of quantitative polymerase chain reaction (qPCR) data was conducted using two-sided t-tests. Finally, differences between the adhesion of leucocytes onto WT or mutated ELCs were assessed using two-sided t-tests on data linearly adjusted for experimental confounding variables. We used patient-derived isogenic iPS cells harbouring either the JAK2 WT (JAK2WT) gene or the homozygous JAK2V617F mutation. (For more details about iPS characterization, see [Supplementary Figs. S1] [S2] [S3], available in the online version) Both cell types were induced to differentiate towards mesoderm for 3 days, and then endothelial specification was started for 2 days (see section Materials and Methods and [Fig. 1A] for details). At that time point, a mean of 65% of the cells were CD144 + CD309 + . CD144+ cells were selected using an immune-magnetic method (purity around 90%) and then expanded for 5 additional days. Produced cells displayed a classical flat, cobblestone endothelial morphology and no morphological differences could be observed between WT and JAK2V617F cells ([Fig. 1B]). Flow cytometry analysis indicated that 99% of cells were CD144 + CD309 + , and also presented the endothelial markers CD31 and CD105 ([Fig. 1C]). To assess if the differentiated ELCs could be properly activated by tumour necrosis factor (TNF)-α, cell surface expression of the leucocyte-adhesion molecules inter-cellular adhesion molecule 1 (ICAM-1) and vascular cell adhesion molecule 1 (VCAM-1) were analysed by flow cytometry. As expected for ECs, TNF-α treatment increased ICAM-1 cell surface levels and induced the expression of VCAM-1 similarly in both WT and mutant clones ([Fig. 1D]). We then studied the angiogenic potential of the ELCs obtained by the differentiation of iPS cells using a tube formation assay in Matrigel. Both types of ELCs were able to form tubes in growth factor-reduced conditions. Induction of angiogenesis with VEGF augmented the complexity of the structures formed, but no difference between JAK2 mutant and WT ELCs was observed ([Fig. 1E]). To better characterize the endothelial phenotype of these cells, we studied vWF expression. Using confocal microscopy with an anti-vWF antibody, we observed the presence of Weibel–Palade bodies (WPBs), a major characteristic of ECs, in both WT and mutant JAK2 ELCs ([Fig. 1F]). An important biological function of the endothelium is the control of the vascular tone through the production of NO. Flow cytometry analysis confirmed that both WT and mutant ELCs expressed the eNOS and its phosphorylation at the serine 1177 residue, indicating that the protein could be found in an active conformation. Finally, NO detection with DAF-FM DA probe upon VEGF stimulation showed that both mutant and WT ELCs performed similarly for functional NO generation, no difference being observed between the two clones ([Supplementary Fig. S4], available in the online version). Altogether, these results show that both JAK2V617F and JAK2WT iPS cells can differentiate into functional ELCs that can further be used to model the role of the endothelium in MPN-associated vascular events. Fig. 1 Human-derived Janus kinase 2 (JAK2)WT and JAK2V617F induced pluripotent stem (iPS) cells are differentiated onto endothelial-like cells (ELCs). (A) Endothelial cell differentiation protocol from iPS cells is depicted. Y27632: ROCK1 inhibitor; CHIR99021: glycogen synthase kinase-3 (GSK-3) inhibitor; SB431542: transforming growth factor (TGF)-β inhibitor. Further details concerning media and cell culturing are indicated in Materials and Methods. (B) Representative phase contrast images of JAK2WT and JAK2V617F ELCs cultured on gelatine. Bar, 50 μm. (C) Endothelial cell surface markers (CD144, CD31, CD309 and CD105), vascular endothelial progenitor cell marker CD34 and haematopoietic cell markers CD45 and CD43 were analysed by flow cytometry on JAK2WT and JAK2V617F ELCs. Negative controls performed with control isotype antibody on JAK2WT ELCs are shown. (D) Cell surface expression of the adhesion molecules inter-cellular adhesion molecule 1 (ICAM-1) and vascular cell adhesion molecule 1 (VCAM-1) on ELCs incubated overnight with or without tumour necrosis factor (TNF)-α (10 ng/mL) was assessed by flow cytometry. Negative controls with control isotype antibody were performed on untreated cells. (E) The ability of the iPS-derived ELCs to form tubular structures was tested on growth factor reduced Matrigel in the presence or absence of vascular endothelial growth factor (VEGF). Bar, 200 μm. (F) The presence of Weibel–Palade bodies was assessed by von Willebrand factor staining (green) by immunocytochemistry and detected by confocal microscopy. Cells were counterstained against CD144 (VE-Cadherin, red); nuclei were detected with 4′,6-diamidino-2-phenylindole (DAPI) (blue). Bar, 20 μm. 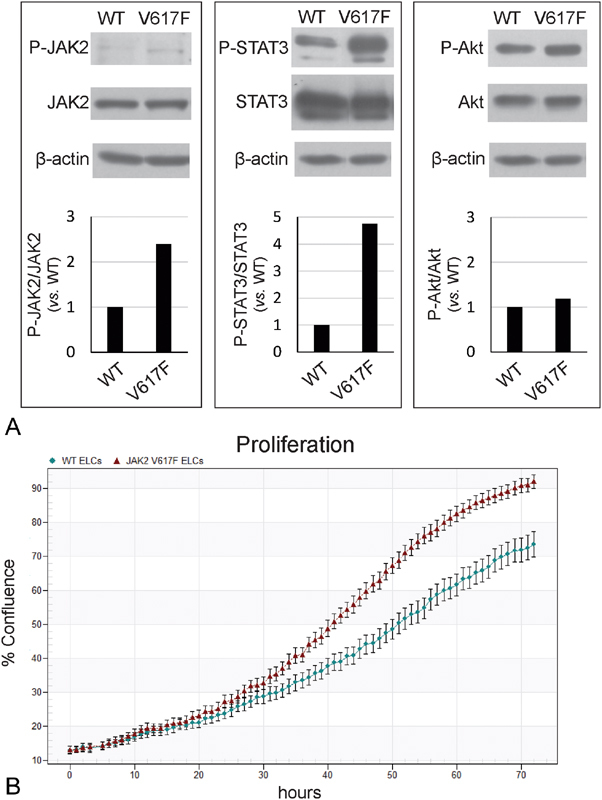 We confirmed by Western blot analysis that the JAK2 protein was expressed in both mutant and WT ELCs at comparable levels, as deduced from total JAK2 and β-actin intensity band evaluation ([Fig. 2A], left panel). Interestingly, we observed a higher level of JAK2 and STAT3 phosphorylation in JAK2V617F positive ELCs ([Fig. 2A], left and middle panel). 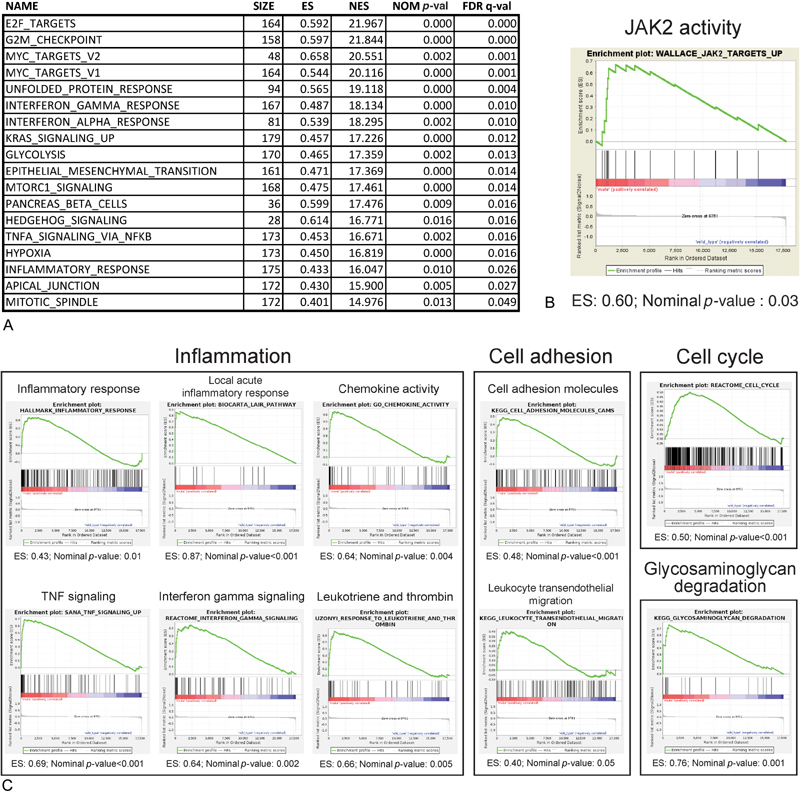 This finding suggests that the presence of JAK2V617F in ELCs might increase the intra-cellular JAK2/STAT3 signalling as observed in JAK2-mutant haematopoietic cells. In agreement with this hypothesis, we observed that the JAK2V617F mutation induced an increased proliferation of ELCs ([Fig. 2B]). We did not observe, however, an increased phosphorylation of Akt ([Fig. 2A], right panel). We continued our investigations by comparing the expression of vWF and P-selectin (CD62P), two major components of WPBs and two major factors of EC-dependent thrombotic events. As measured by confocal microscopy, both vWF and P-selectin were significantly over-expressed in JAK2V617F compared with JAK2WT ELCs. Both the numbers and the fluorescence intensity of WPBs were found to be higher in JAK2V617F ELCs in comparison to the WT ones ([Fig. 3A]). We further extended the comparison to the extra-cellular expression of P-selectin and observed an increased accumulation on the surface of JAK2 mutant compared with WT cells ([Fig. 3B]). All the protein expression data have been obtained in replicates of two different batches of ELCs coming from distinct differentiation processes. These results show that the presence of the JAK2V617F mutations may confer an activated phenotype to ECs. Fig. 2 Janus kinase 2 (JAK2)V617F endothelial-like cells (ELCs) present JAK2 and signal transducer and activator of transcription 3 (STAT3) over-activation and a higher proliferative rate. 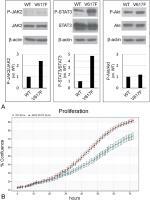 (A) Phosphorylation status of JAK2, STAT3 and Akt were assessed by Western blotting in whole ELCs lysates from cells maintained in a growth factors reduced medium. Intensity signals were quantified by densitometry. The ratio between phosphorylated form and total protein intensities was calculated for each lane and normalized to the wild-type (WT) condition for each of the three proteins analysed. Results presented are representative of at least three independent experiments. (B) ELCs were seeded at 10% confluency and monitored during 72 hours by taking pictures every hour in the Incucyte S3 live-cell analysis system. Phase contrast images were processed to calculate the percentage of confluence used to draw the proliferation curves. Data are expressed as mean ± standard error of the mean (SEM). Fig. 3 von Willebrand factor (vWF) and P-selectin (CD62P) are differentially expressed in Janus kinase 2 (JAK2)V617F endothelial-like cells (ELCs). vWF and P-selectin cellular localization was analysed by immunocytochemistry on ELC monolayers. (A) Representative confocal images of intra-cellular staining for vWF (green) and P-selectin (CD62P, red) are shown (left panel). Nuclei are highlighted with 4′,6-diamidino-2-phenylindole (DAPI) (blue). Images were processed to quantify the amount of Weibel–Palade bodies (WPBs) (defined by the presence of vWF), the amount of WPBs stained for P-selectin and the total fluorescence intensity for both proteins (right panel). The results of the quantifications and its statistical significance for differences between JAK2WT and JAK2V617F cells are shown. (B) Representative images of extra-cellular staining of P-selectin (CD62P, green). Fluorescence intensity for P-selectin was measured and compared between JAK2WT and JAK2V617F cells. To better delineate the consequences of JAK2V617F expression on EC biology, transcriptomic profiles were analysed. The analysis was performed on replicates of RNA extracted from two different batches of ELCs coming from distinct differentiation processes ([Fig. 4A]). Data were adjusted for unwanted technical and biological batch effects (ComBat procedure). JAK2 expression was found to be comparable between WT and JAK2V617F ELCs (adjusted p-value: 0.39; see expression levels on [Supplementary Fig. S5], available in the online version). A non-supervised hierarchical clustering showed plain segregation between JAK2V617F and WT samples ([Fig. 4B]). A heat map from this analysis including genes with a coefficient of variation of the expression levels superior to 0.045 (568 genes) is shown in [Fig. 4C]. LIMMA-mediated supervised analysis resulted in 428 genes from a total of 22,551 being differentially expressed (259 up- and 169 down-regulated) in JAK2V617F versus WT ELCs, for a FDR of < 1%. KEGG pathway enrichment analysis of these genes draws a first picture of the transcriptomic profile of the JAK2V617F ELCs compared with their WT counterparts ([Fig. 3D]). Interestingly, in addition to the PI3K-Akt signalling pathway which can be activated downstream of JAK2, we found a dysregulation of cell adhesion molecules (CAMs) and of the coagulation cascade, both involved in thrombosis. 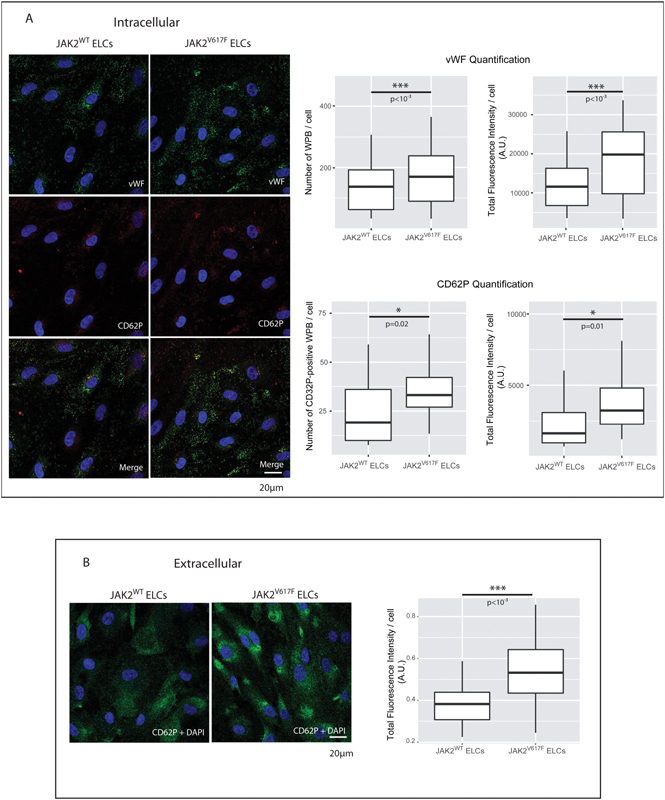 Moreover, pathways implicated in receptor interaction with the extra-cellular matrix (ECM) were also dysregulated in JAK2V617F ELCs, which can affect vascular remodelling and play a role in processes such as neoangiogenesis or stenosis. Of note, the most enriched pathway in JAK2V617F ELCs was the haematopoietic cell lineage that can be related to the dual haematoendothelial plasticity of these cells. Our model can therefore provide some clues in regard of the origin of JAK2V617F-positive ECs previously found in the splanchnic vasculature and in highly neovascularized sites of extra-medullary haematopoiesis in some patients. A list of the genes found enriched in the KEGG pathway analysis is given in [Supplementary Table S1], available in the online version. Fig. 4 Janus kinase 2 (JAK2)WT and JAK2V617F endothelial-like cells (ELCs) transcriptomic analysis. ELCs were grown to confluence and harvested for ribonucleic acid (RNA) isolation before performing transcriptomic analysis with GeneChip Human Transcriptome 2.0 Arrays from Affymetrix. 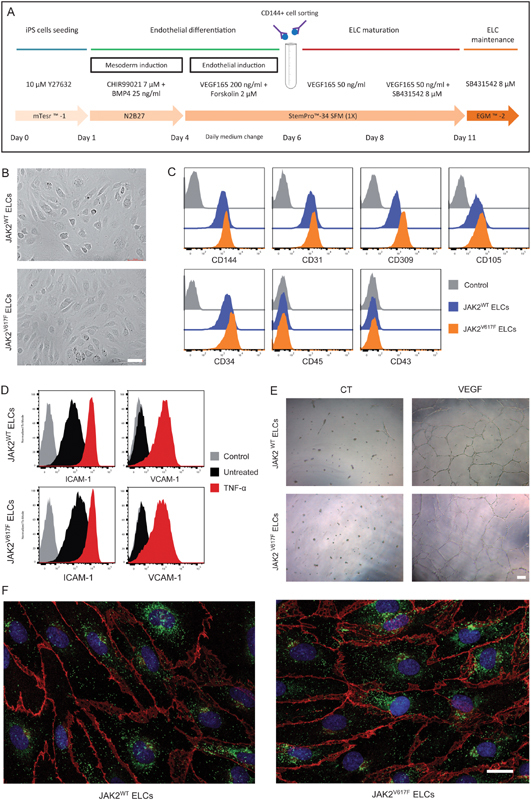 Two independent experiments were performed from two independent endothelial cell differentiations (A: JAK2WT, n = 2; JAK2V617F, n = 2; and B: JAK2WT, n = 3; JAK2V617F, n = 3). (A) Flowchart indicating the procedures followed in the transcriptomic analysis. (B) Non-supervised hierarchical clustering from 22,551 annotated genes. (C) Non-supervised heat map and hierarchical clustering for genes with a coefficient of variation > 0.045 (568 annotated genes). (D) First supervised analysis approach using LIMMA normalization. A total of 22,551 annotated genes were filtered in function of the false discovery rate (FDR) q-value (< 1%), resulting in 428 genes with a p-value of < 0.00019. This selection was used to query for enriched Kyoto Encyclopedia of Genes and Genomes (KEGG) pathways. The resulting enriched pathways are indicated. p-Values are plotted as the negative of their logarithm. A supervised analysis by gene set enrichment analysis (GSEA) was performed which allowed us to highlight additional pathways dysregulated in JAK2V617F-positive ELCs ([Fig. 5]) including as expected an over-expression of JAK2 target genes ([Fig. 5B]). The table in [Fig. 5A] lists the most statistically significant enriched gene sets from the MSigDB Hallmark collection (cut-off: adjusted p-value for FDR < 0.05). Selected enrichment profiles from this and other MSigDB collections are shown in [Fig. 5B]. 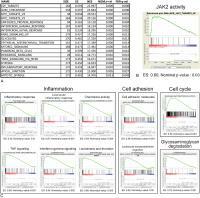 Interestingly, genes associated with inflammation were over-represented in the transcriptome of JAK2V617F-positive ELCs, with dysregulation of both TNF-α and interferon (IFN) γ signalling pathways ([Figs. 5A and C]). This finding suggests a pro-inflammatory state of ELCs harbouring the JAK2V617F mutation. These cells also displayed enriched expression of genes involved in cell adhesion and leucocyte trans-endothelial migration ([Fig. 5C]). More precisely, we identified a set of over-expressed genes highly related to pro-inflammatory and/or pro-adhesive properties such as CX3CL1, CXCL2, CXCR4, ALCAM, BST2, SELP and the cancer stem cell marker CD24, previously found to be induced in activated endothelium. 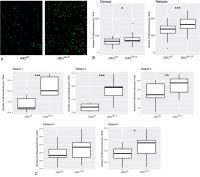 We have also found dysregulation in genes coding for important ECM modulators or secreted glycoproteins that could affect the endothelium properties, such as ADAMTS1, involved in venous stenosis and thrombosis; TNC, an ECM glycoprotein involved in fibrosis and inflammation that also supports platelet adhesion; and VCAN, a multi-functional ECM glycoprotein modulator of the inflammatory response also associated to thrombosis. Finally, we have identified several dysregulated genes that could further induce a pro-thrombotic phenotype of JAK2V617F ELCs. Among them, IL1RL1 coding for the interleukin (IL)-33 receptor was significantly over-expressed and it is known that IL-33 can induce the expression of tissue factor (TF) in ECs. We also found dysregulation of SULF1 which is involved in de-sulphation of cellular heparan sulphate proteoglycans, and of the sphingosine-1-phosphate receptor 3 (S1PR3) that has a role in P-selectin exposure to the cell surface but also in vWF release from WPBs. Quantitative reverse transcription PCR (RT-PCR) analyses in ELCs derived from various differentiation experiments confirmed the over-expression of these genes, validating the findings of microarray assays ([Fig. 6]). Expression levels, fold changes and statistical values obtained from the microarray analysis for the genes discussed in this article can be found in [Supplementary Table S2], available in the online version. Fig. 5 Gene set enrichment analysis (GSEA) on JAK2V617F vs. JAK2WT endothelial-like cells (ELCs). GSEA was performed thanks to the GSEA software and MSigDB (Molecular Signatures database) available at http://software.broadinstitute.org/gsea/index.jsp. Collections H (hallmark), C2 (curated gene sets) and C5 (GO gene sets) were explored. Hallmark collection includes 50 gene sets representing well-defined biological states or processes, and it is intended to give a first overview on the transcriptomic profiles analysed. (A) Hallmark gene sets found to be enriched in Janus kinase 2 (JAK2)V617F ELCs with an false discovery rate (FDR) of < 0.05 are shown. (B) Enrichment plot for the ‘WALLACE_JAK2_TARGETS_UP’, which assembles genes up-regulated more than sevenfold by expressing JAK2 in a JAK2 null cell line (gene set based on the work of Wallace et al in 2004). (C) Selection of representative gene sets illustrating the major aspects detected in the gene set enrichment analysis affecting the endothelial cell biology. Abbreviations: ES, enrichment score; NES, normalized enrichment score; NOM p-val, nominal p-value; FDR q-val, false discovery rate q-value. Fig. 6 Genes over-expressed in Janus kinase 2 (JAK2)V617F endothelial-like cells (ELCs). A selection of differentially expressed genes was validated by quantitative polymerase chain reaction (qPCR) from different ELC differentiation batches than those used for the microarray study. Results from representative experiences are shown. Data are indicated as mean ± standard deviation (SD) (n = 3; *p < 0.05; **p < 0.01; ***p < 0.001. p-Value for CXCR4 is 0.073). Thrombotic events are critically dependent on the interactions between WBCs and ECs. Because transcriptomic analysis revealed that ELCs carrying the JAK2V617F mutation were characterized by dysregulated expression of several pathways involved in cell adhesion, we undertook experiments to explore the functional relevance of these findings. We established cell adhesion assays using WBC isolated from healthy donors or from MPN patients, incubated on JAK2 mutant or WT ELCs. Briefly, WBC were stained with green calcein before being put on contact with ELCs monolayers for 2 hours in static conditions. After washing, the remaining adhered WBCs were detected by fluorescence microscopy ([Fig. 7A]). We first observed that binding of WBC derived from healthy donors was clearly higher on JAK2V617F ELCs compared with JAK2WT ELCs ([Fig. 7B], left panel), confirming that the JAK2 mutation provides a pro-adherent phenotype to ECs. When we tested WBC obtained from JAK2V617F mutated MPN patients, we observed an even more important increase in the relative numbers of adherent cells on JAK2 mutant compared with JAK2 WT ELCs ([Fig. 7B], right panel). Results obtained for each of the patients individually, from which the right panel of [Fig. 7B] has been constructed, are presented in [Fig. 7C]. Altogether, these results confirm the data derived from the transcriptomic analysis and show that the presence of the JAK2V617F mutation confers a pro-adherent phenotype to ECs. Fig. 7 Cell adhesion assay. White blood cells (WBCs) from healthy donors and myeloproliferative neoplasm (MPN) patients were isolated and stained with green calcein before co-incubating them for 2 hours with endothelial-like cell (ELC) monolayers. Pictures of the remaining cells after removal of the non-attached cells were taken for quantification. (A) Representative images from the cell adhesion test performed with patient's WBCs onto Janus kinase 2 (JAK2)WT (left panel) or JAK2V617F (right panel) ELCs. (B) Adhesion of WBCs onto JAK2WT or JAK2V617F ELCs for the donor's (left panel) and the patient's (right panel) groups. (C) Adhesion of WBCs onto JAK2WT or JAK2V617F ELCs is shown for each patient individually. (Donors, n = 4; patients, n = 5; * p < 0.05; **p < 0.01; ***p ≤ 0.001. p-Value for patient 4 is 0.052). Thrombosis is the major cause of morbidity and also mortality in patients with MPN, with incidences ranging from 11 to 25% in ET and 12 to 39% in PV. However, although the presence of JAK2V617F-mutated blood cells is regularly reported as a risk factor, the pathogenesis of thrombotic events in MPN patients is still poorly understood. Because ECs play a central role in thrombus formation, mainly through interaction with circulating platelets and leucocytes, the description of JAK2V617F-positive ECs in MPN patients questioned the role such mutated cells could have in the patients' thrombophilic state. To model the consequences of this mutation in the endothelial lineage, we chose to develop an iPS cells approach. Indeed, the possibility to generate patient-derived iPS cells and to differentiate them towards a specific cell lineage is a powerful tool to model diseases with germline or acquired genetic alterations. Several haematologic diseases have been modelled using this approach, such as Fanconi anaemia or MPNs,  as well as diseases affecting the EC compartment. If MPN patient-derived iPS cells have already been used to study the effects of the JAK2V167F mutation in a haematological context,  this study is the first using this approach to assess the effects of this mutation when present in ECs. The human ELCs we obtained from the differentiation of JAK2 WT or mutant iPS cells presented comparable phenotype and behaviour to “native” EC in terms of morphology, cell surface and intra-cellular markers, response to TNF-α, tube formation and NO production, showing that the JAK2V617F mutation does not impair endothelial differentiation. Yet, as expected, JAK2V617F ELCs presented increased phosphorylation levels of JAK2, but also of STAT3. Probably due to this increased intra-cellular signalling, JAK2V617F ELCs had a higher proliferation rate than their WT counterparts, confirming the results reported by Lin et al in murine ECs. To better characterize the consequences that the JAK2V617F mutation could have in ECs, we have undertaken a transcriptomic analysis to highlight the main regulatory pathways modified in this context. Non-supervised GSEA directly pointed out a stronger JAK2 activity in the ELCs with the JAK2V617F mutation, validating our model. Moreover, in line with the higher proliferation rate observed in these cells, gene sets affecting the cell cycle have also been found dysregulated. Supporting a role for mutant ECs in the predisposition of JAK2V617F-positive MPN patients to thrombotic events, the transcriptomic analysis identified several dysregulated pathways involving potential regulators of haemostasis and clotting formation. These included the ‘Complement and coagulation cascades’ KEGG Pathway as well as a MSigDB gene set involving leukotriene and thrombin signalling. We also found an up-regulation of matrix metallopeptidase (MMP)-9, MMP-1 and a disintegrin and metalloproteinase with thrombospondin motif (ADAMTS)-1 metalloproteinases, all of them able to inhibit the tissue factor pathway inhibitor (TFPI). These three MMPs can also cleave versican (that we found over-expressed in JAK2V617F ELCs), liberating degraded fragments that have a suppressive effect on TFPI activity. When under-sulphated, versican loses its avidity for anti-thrombin, predisposing the vascular wall to thrombosis. In this regard, it is important to notice that we have found sulphatase 1 to be highly induced in JAK2V617F ELCs, suggesting that versican could be in a pro-thrombotic state in the ECM surrounding these cells. Moreover, versican interacts at the cell surface with tenascin-C (TNC), another ECM protein we have found over-expressed in the mutated ELCs. Altogether, both proteins promote the adhesion of platelets to ECs. In addition, JAK2V617F ELCs also present an increased expression of IL1RL1, the receptor through which IL-33 induces TF expression in ECs, suggesting that the JAK2V617F mutation could exacerbate the activation of the coagulation cascade by TF in case of endothelial damage, and facilitate the recruitment of platelets to form a local clot. To date, different teams have addressed the question of haemostasis in JAK2V617F transgenic mice models. Hobbs et al produced an ET mouse model with increased platelet reactivity and reduced bleeding times by addressing JAK2V617F expression to megakaryocytes and platelets. However, knock-in mice with expression of JAK2V617F in haematopoietic cells developed by Lamrani et al showed prolonged bleeding times (reproducing previous results obtained by Zaleskas et al), altogether with a decrease of high molecular weight vWF multimers. Etheridge et al developed different mouse models expressing human JAK2V617F in the haematopoietic lineage and/or the EC compartment. Their results suggested that JAK2V617F ECs somehow had a negative impact on proper clotting formation, even if these cells presented higher intra-cellular levels of vWF than their WT counterparts. It is surprising that most mice models did not reproduce the pro-thrombotic state found in patients, but rather the bleeding predisposition which is found in a small number of patients, essentially those with extreme thrombocytosis. This shows the difficulty to develop mice models to explore the pathogenesis of the thrombophilic state associated with MPN in humans. Interestingly, confirming results by Etheridge et al, we have also observed an increased amount of vWF in the JAK2V617F ELCs, as well as of the numbers of the WPBs that store it. At high shear rates, vWF has a role in platelet recruitment, whereas at low shear rates, as found in the venous vasculature, vWF can promote adhesion of leucocytes to the endothelium. So does the adhesion molecule P-selectin, which we have found to be increased in JAK2V617F ECs at the transcriptional level, and also at the protein level both in the WPBs and at the cell surface. An intact endothelium of blood vessels is essential to prevent thrombosis, mainly by preventing cell attachment. Indeed, it has been shown that adhesion of monocytes and neutrophils to the venous endothelium is an initiating event for thrombosis. Such adherence is possible on activated ECs through the expression of various adhesion molecules. Importantly, both KEGG and GSEA enrichment analyses pointed out the up-regulation of genes coding for CAMs in our JAK2V617F ELCs. Among them, we found P-selectin, a main actor of leucocytes adhesion on endothelium, together with other important adhesion molecules such as BST2, ALCAM and CD24. In line with these findings supporting a role for mutant ECs in the pro-thrombotic state of MPN patients, GSEA results from different collections also pointed out inflammation as one of the major characteristics of the JAK2V617F ELCs' phenotype. Indeed, inflammation is linked to activated endothelium and favours leucocyte attachment. We have validated by qPCR the up-regulation of a series of genes known to be induced in activated ECs in an inflammatory context: CXCR4, a pro-atherogenic stimulus, inductor of monocyte chemoattractant protein-1 and IL-8 expression in ECs; CX3CL1, a potent chemoattractant for T cells and monocytes known to promote strong adhesion of leucocytes to activated ECs; and CXCL2, which promotes the adhesion of neutrophils to ECs in vitro. Moreover, JAK2V617F ELCs express higher levels of the S1PR3 than JAK2WT ELCs, predisposing them to respond to sphingosine-1-phosphate signalling for vWF release and P-selectin exposure at the cell membrane. Finally, the ECM proteoglycan versican, which we have found to be up-regulated in JAK2V617F ELCs, has also the ability to bind leucocytes chemoattractant chemokines and P-selectin glycoprotein ligand-1, promoting leucocyte aggregation at the EC surface. Our findings suggesting that JAK2V617F ELCs are prone to favour leucocyte adhesion were confirmed by adhesion assays using freshly isolated leucocytes. Indeed, the adhesion of donor-derived WBC was significantly increased on JAK2-mutated ELCs compared with WT. This difference was even more pronounced when we used leucocytes derived from JAK2-mutated MPN patients, probably due to an increased basal activation in these cells. Although JAK2V617F-mutated ECs have been identified in MPN patients in selected territories (like the hepatic or splenic vasculature), they have not been described yet in bone marrow micro-vessels. Interestingly, transcriptomic analysis of JAK-mutant ELCs revealed several dysregulated pathways that could play a role in haematopoiesis regulation or in the development of fibrosis, if such cells were present in the bone marrow micro-environment. For example, pathway enrichment analyses identified different gene sets affecting the extra-cellular compartment, such as ‘Glycosaminoglycan Degradation’ or ‘ECM-receptor interaction’. Indeed, many of the genes identified are ECM modulators that may participate in fibrotic processes including myelofibrosis, such as VCAN, TNC and MMP9, all of them induced by TGF-β, while the expression of ADAMTS-1, which induces TGF-β altogether with MMP9, is also found to be increased. Transcriptomic analysis also pointed out the induction of the collagen and elastin fibres consolidator lysyl oxidase (LOX), a protein essential for vascular wall integrity and endothelial function, known to be induced in MPNs' bone marrow and associated to increased thrombosis when over-expressed in megakaryocytes and platelets. Interestingly, LOX over-expression in ECs has been found to inhibit the expression of its own inhibitor, A2M (Guadall 2011, personal observation), which is found to be down-regulated in our transcriptomic analyses. Although these hypotheses deserve confirmation, our results suggest that if JAK2V617F ECs are present in the bone marrow niche, they could contribute to myelofibrosis development. Finally, Zhan et al recently reported that JAK2V617F ECs give a growth advantage to JAK2V617F-positive haematopoietic stem/progenitor cells compared with WT ones. In link with these results, we have identified ALCAM and TNC genes to be up-regulated in mutant ELCs. ALCAM, described to be highly associated with embryonic haematopoiesis and vasculogenesis, supports the development of haematopoietic progenitor cells. TNC promotes haematoendothelial development, and has been found to be up-regulated in stromal cells and ECs during haematopoietic recovery after myeloablation. Both genes could participate in the clonal selection observed during MPN development. In conclusion, our results show that human ELCs differentiated from patient-derived iPS with the JAK2V617F mutation have a pro-thrombotic and pro-inflammatory phenotype. These cells displayed increased adhesion ability to normal and MPN patients' derived leucocytes, and should confer pro-adhesive and pro-thrombotic properties to the endothelium that could account for local thrombosis. Patients with myeloproliferative neoplasms (MPN) are prone to develop thrombosis that represents the major cause for mortality and morbidity in these patients. The JAK2V617F mutation is the main genetic alteration found in haematopoietic cells in MPN patients. The JAK2V617F mutation has been described in MPN patients' endothelial cells but its impact on those cells has never been studied. Using MPN patients-derived induced pluripotent stem cells (iPSCs), we show that the presence of the JAK2V617F mutation is compatible with the development of endothelial cells. The presence of the JAK2V617F mutation is associated with an altered mRNA and protein expression profile in endothelial cells. Leucocyte adhesion on endothelial cells expressing JAK2V617F is increased compared with their wild-type counterpart. Our results show that JAK2V617F endothelial cells have a pro-inflammatory and pro-adherent phenotype strongly suggesting they can participate to thrombosis events observed in MPN patients. The authors thank Chloe James for sharing materials, Wendy Cuccini, Marie-Helene Schlageter (Saint-Louis Hospital), Antonio Alberdi (Plateforme Technologique Saint Louis, Institut Universitaire d'Hématologie, Université Paris Diderot, Hôpital Saint Louis, Paris) and Annelise Bennaceur-Griscelli (Easteam Paris Sud) for technical help and helpful discussions. ** Jean-Jacques Kiladjian co-supervised the study.